The numbering system connects the goals and activities to the Implementation Plan. Billions of dollars are being spent on development in our city. We’d like to see a full return on investment by ensuring that our new buildings and public spaces are attractive and comfortable year-round. So, we’ve developed winter design guidelines which provide a robust winter lens for all development and redevelopment throughout the city. Lighting can play a crucial role in making a place more inviting, magical, memorable and joyful. We know that we also have to be mindful of dark sky principles. We started off working on a Creative Lighting Master Plan, but we have evolved our thinking. While the focus of this strategy is still lighting for placemaking, we also know it is about managing darkness and that it also has to work on light efficiency and health. It will be about being more strategic with our creative lighting. Our city has some beautiful heritage buildings with interesting and attractive architectural features. We’d like to highlight some of those features year-round, so we’ve launched a pilot project to light heritage buildings. This cost-sharing program is intended to provide exterior lighting that enhances or highlights the visual presence of some of Edmonton’s historic resources, adding to our sense of place, identity and pride. Patios are a key way to add vibrancy to our city and help support the prosperity of businesses in winter. 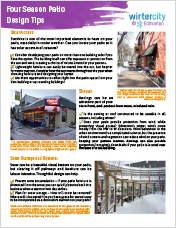 We worked with Emma Sanborn, a graduate of the Lulea University of Technology Master's programme in Climate Sensitive Urban Planning on a tip sheet.